Along with an advert in Permaculture Magazine, we advertise on a mainstream holiday rental website, through which we encounter the majority of our paying guests. So you can imagine that not all our holidaymakers have an ecological bent. And we’re not permacultural evangelists. There’s a variety of things to inform our guests of when they arrive. One of which is to only put French-bought toilet paper down the toilet, important even for a conventional septic tank. Having then explained about the recycling box and compost bin, imagine the effect on our travel-weary arrivants were we to tell them not to switch on the electric heaters, to switch off the lights when they didn’t need them … oh, and don’t spend to long in the shower ? Have a nice stay ! The answer is in design (of course, this is permaculture). 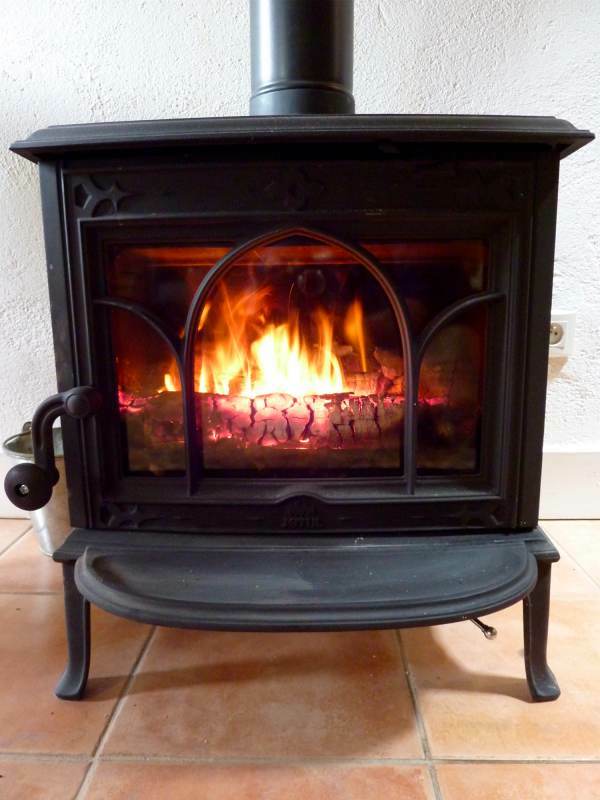 So, at great expense, we have installed an easy-to-light, super-efficient, Danish-built Jøtul woodstove and removed the electric panel heater downstairs. 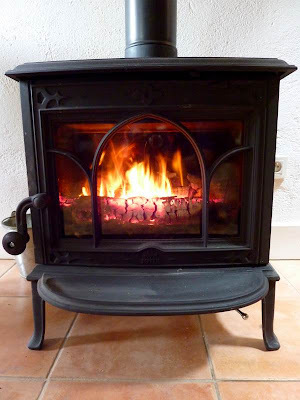 We offer to set a fire a couple of hours before they’re due home in the evening, if they want. Water-wise, we have been very impressed by our economising showerhead and tap aerators from Aqua-Techniques: see my blog of 13th December 2006. The showerhead is the more impressive, in that you get satisfactorily soaked, so much so that I found it difficult to believe that it was using less water, which it was, and to a surprising degree. So our holidaymakers can stay agreeably clean without using too much water and without being dictated to by eco-fascists! Thanks to Sue and Val (aided by Pete) who’ve helped me identify the mystery yellow flower of my last blog. 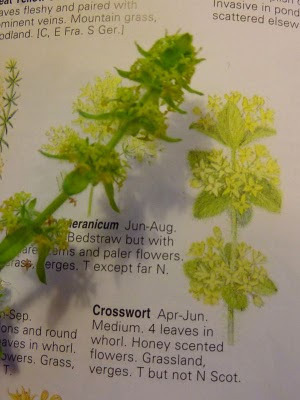 It is, without doubt, crosswort, (Cruciata laevipes), a member of the bedstraw (Rubiaceae) family of plants. The problem is then that our sheep aren’t eating it, so it is spreading by seeds and stolons (horizontal runners). We must therefore assume that they’re in good health and not suffering from bowel obstructions, rheumatism or dropsy! So, I took my ash-handled Austrian scythe to it to teach it a lesson. Like a lot of weeds, if one keeps cutting them before they set seed, they weaken and (hopefully) die. Next blog: how we used sheep’s wool insulation to make our pond edges prettier. Glad to see you have corrected some typos. Are you in favour of split infinitives? If not you might like to correct 'which is to only put' in 3rd para. In Latin, an infinitive is one word and should therefore not be split. In English, an infinitive is two words, "to go" for example, and can be split, unless your an old pedant schoolmaster. It often sounds nicer, at least to my ears, to write for example, "to boldly go" rather than "to go boldly" and if it's good enough for Capt. Kirk and the Starship Enterprise, it's good enough for my blog. And please note David, once the compost toilet is built, there'll be no flushing here !